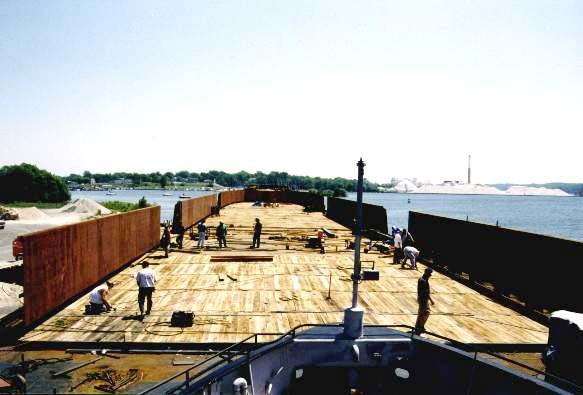 The conversion of the former carferry "City of Midland 41"
Dimensions: 400' x 59' Loaded draft: 19'6"
February 28, 1998. 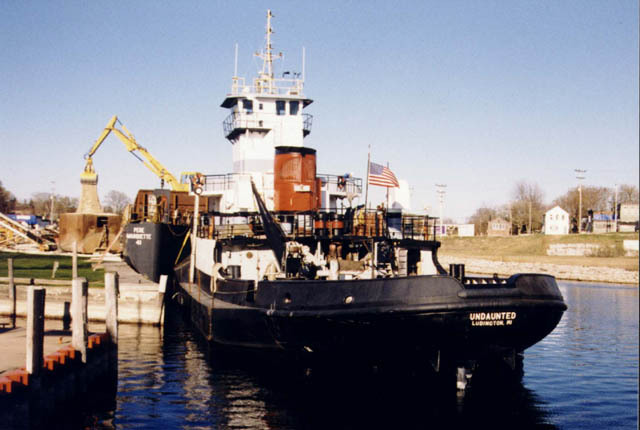 The former Navy tug "Undaunted" arrived Ludington on Wednesday, February 25th. 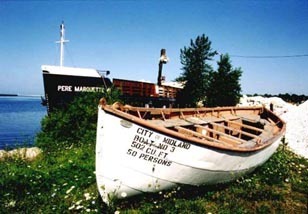 She is to be mated with the former City of Midland. 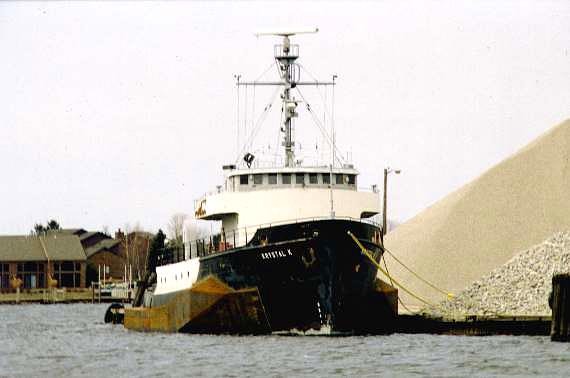 The tug "Undaunted" had her pilot house removed on Friday, March 27th. 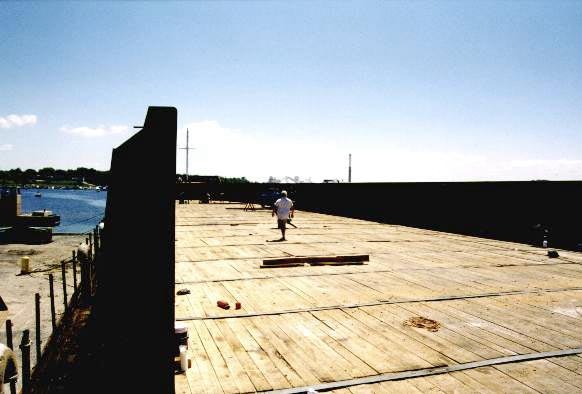 A new raised pilot house will be installed. 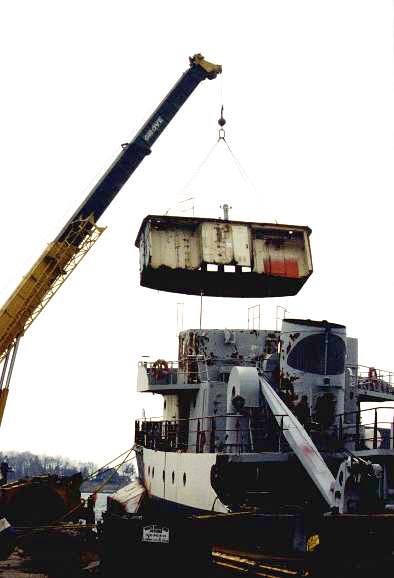 Pilot house being removed from the Undaunted. 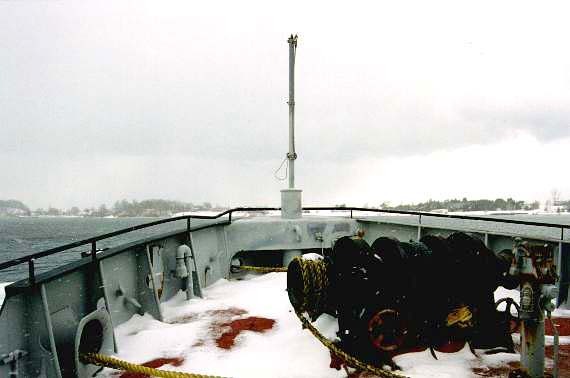 April 5, 1998. 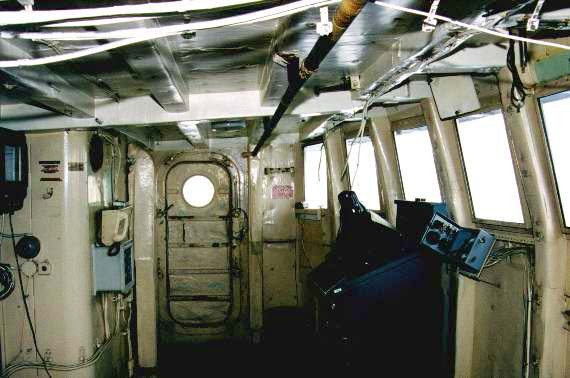 The new pilot house has not yet been intalled on the Undaunted, but here are a few shots of her minus her old pilot house. 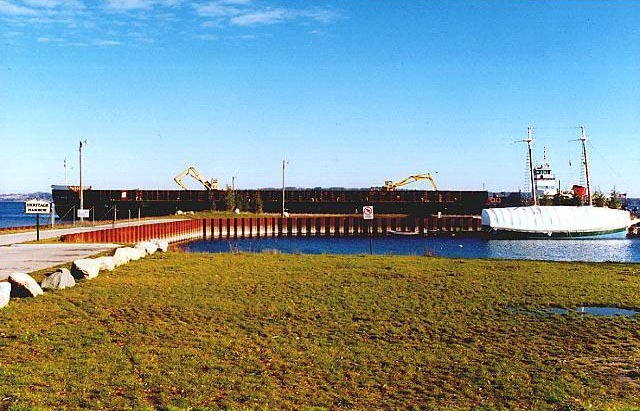 April 21, 1998. 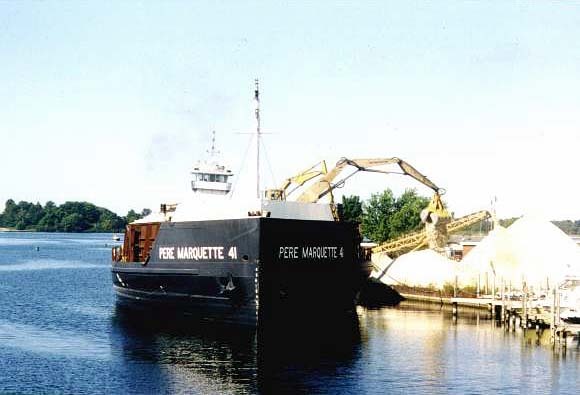 The Pere Marquette 41 was towed to Sturgeon Bay, WI. 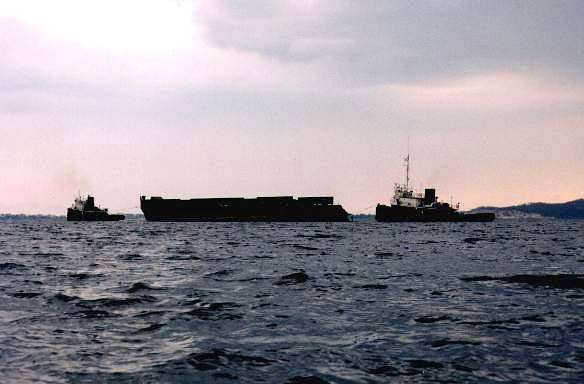 She was towed out by the "Mary Page Hannah" and the "Carl William Selvick. 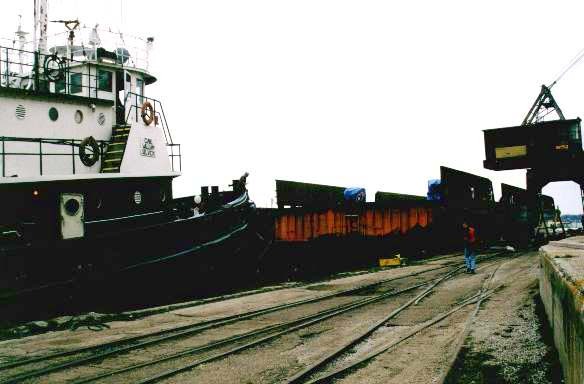 Pulling away from the Mart Dock. 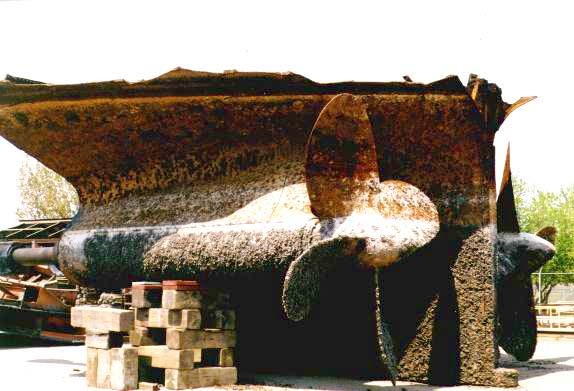 Mike Modderman. 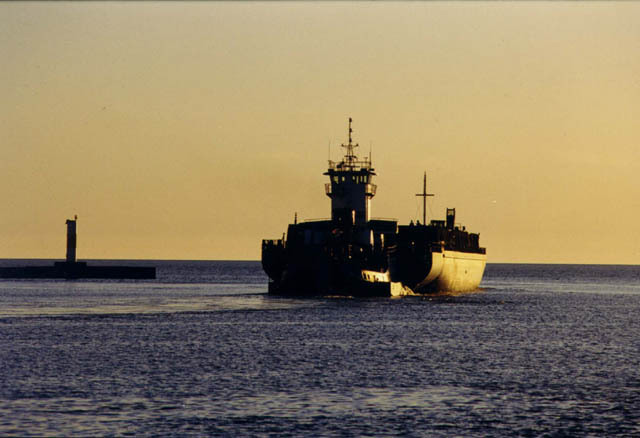 Heading for Lake Michigan. 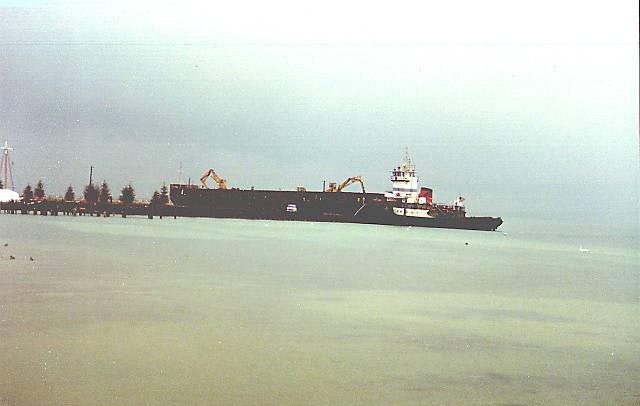 Mike Modderman. 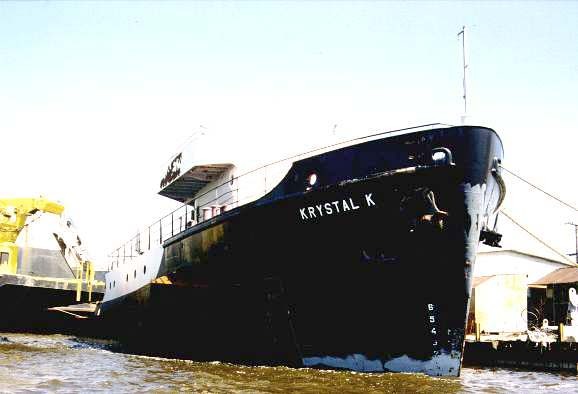 April 22, 1998. 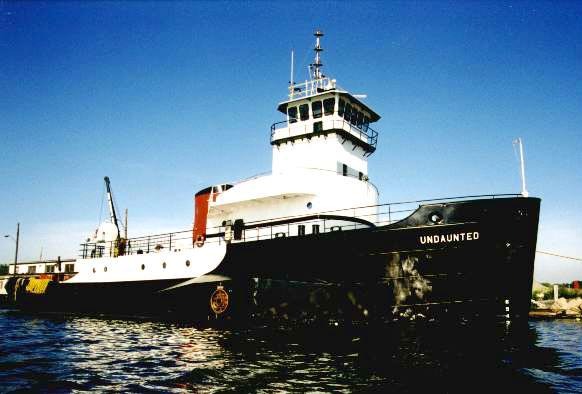 The new pilot house was placed on the tug "Undaunted". 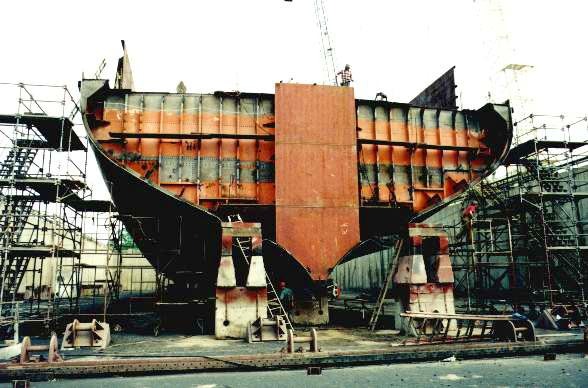 May 2, 1998. 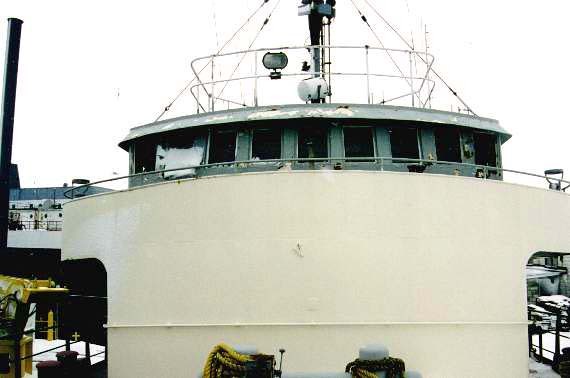 Windows were installed on the Undaunted. 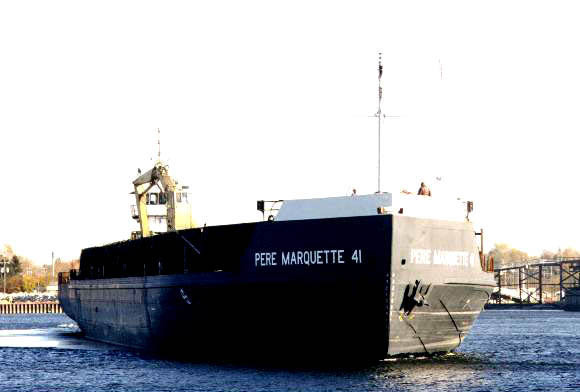 Flight photographs of the Pere Marquette 41's arrival to Sturgeon Bay, by Jeff Rogers. 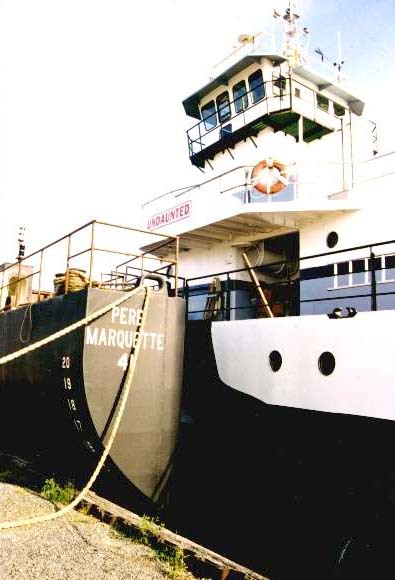 The Pere Marquette 41 in drydock May 9, 1998. 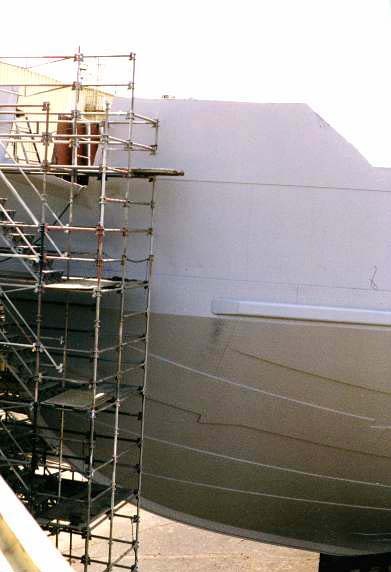 Photos courtesy of Bob Strauss. 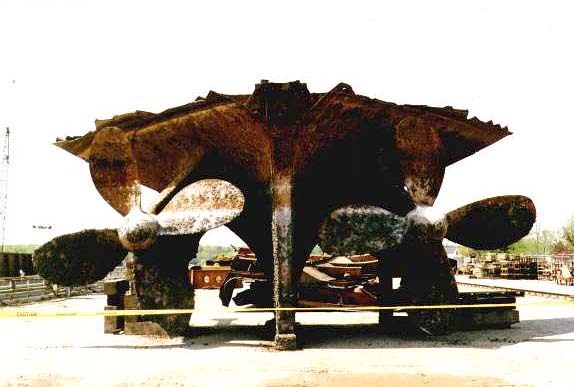 Stern section with the props have been removed. 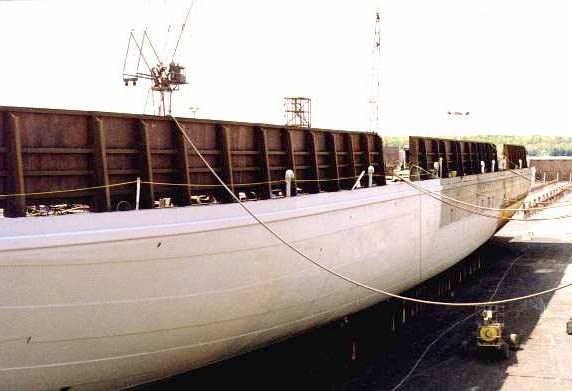 The PM 41 in drydock at Sturgeon Bay, photos by Jeff Rogers. 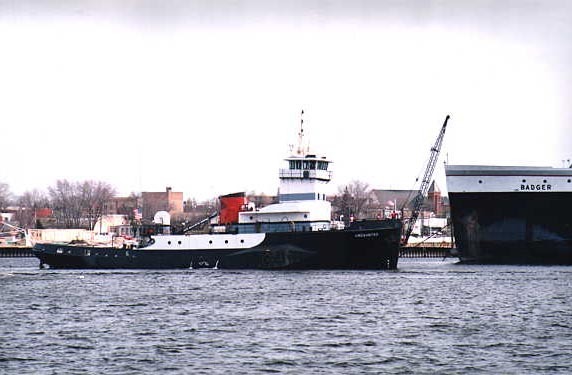 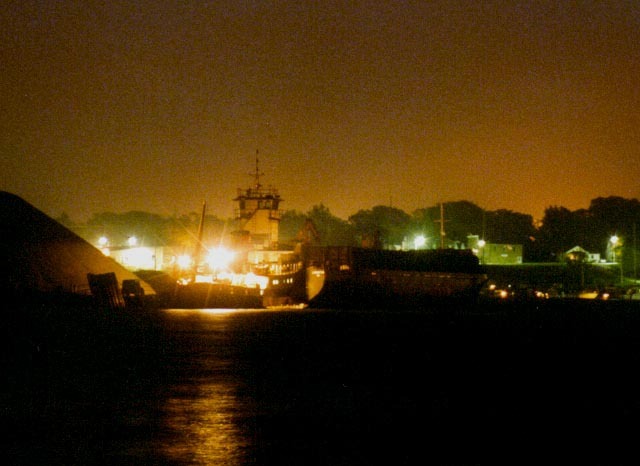 The tug "Undaunted" left Ludington on 5/25/98 for Escanaba. 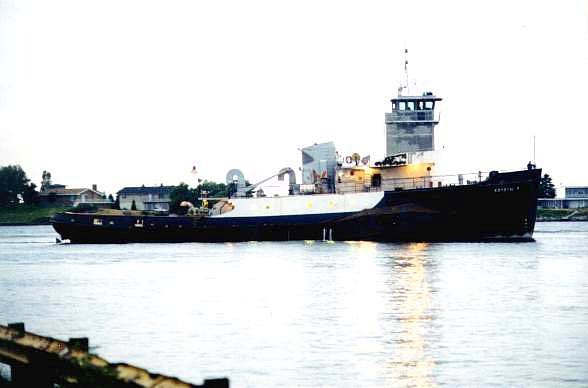 She cast off her lines at 6:10 AM and exchanged "salutes" with the S.S. Badger as she passed by. 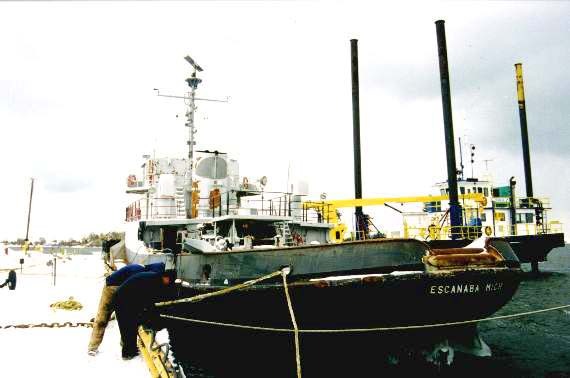 The tug is going to Escanaba to be sandblasted and painted and to have the pin installed (for connecting with the barge). 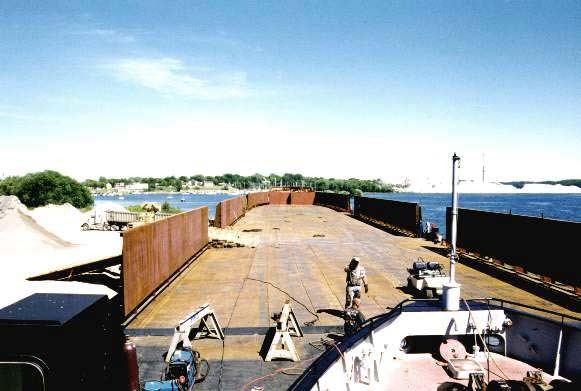 Once this is done, she will go to Sturgeon Bay to pick up the Pere Marquette 41 (former carferry City of Midland) and return to Ludington. 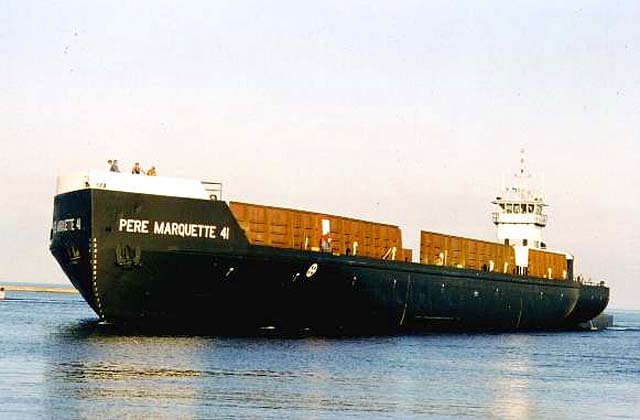 The Pere Marquette 41 arrived Ludington on June 17th, 1998. 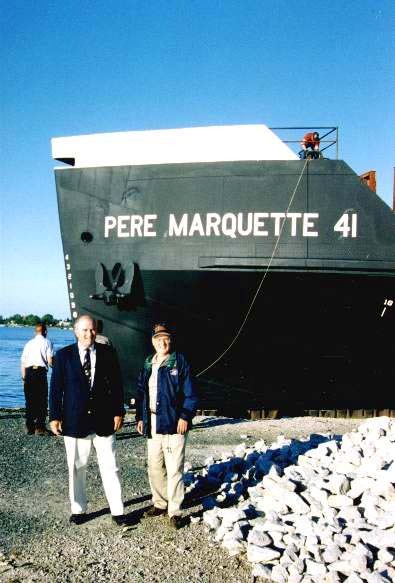 Two of the owners of Pere Marquette Shipping pose in from of the bow of the Pere Marquette 41. 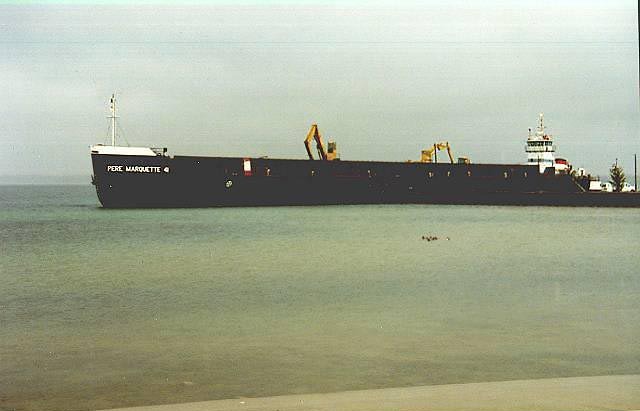 M. Hanley. 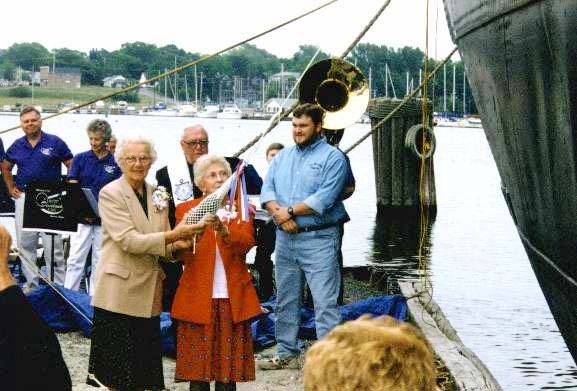 A christening ceremony was held on June 18th, 1998. 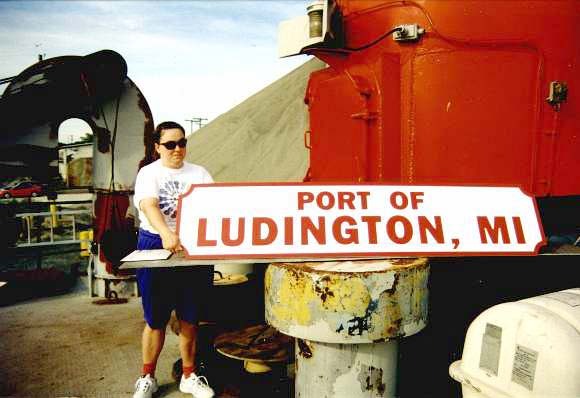 July 10 - 12, 1998. 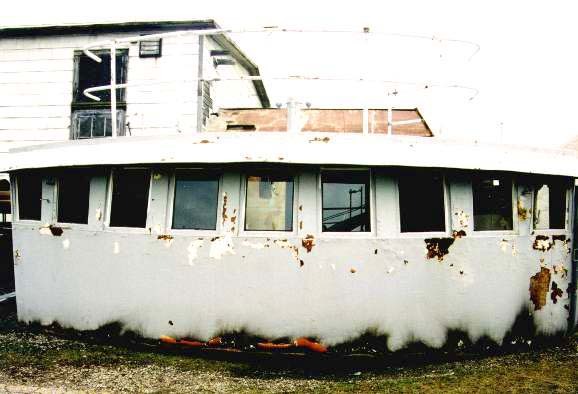 Special thanks to Mike Modderman for the boat ride, these photos would not have been possible without him! 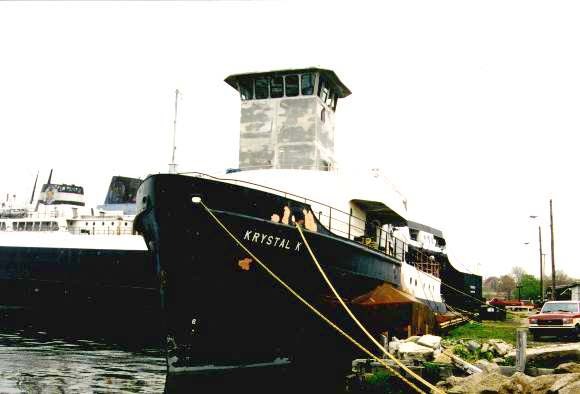 July 18, 1998. 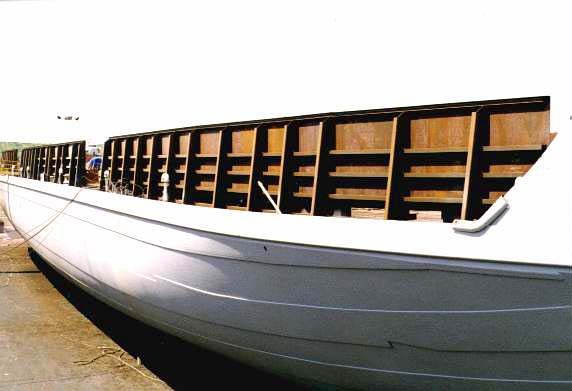 Almost ready for her first trip. 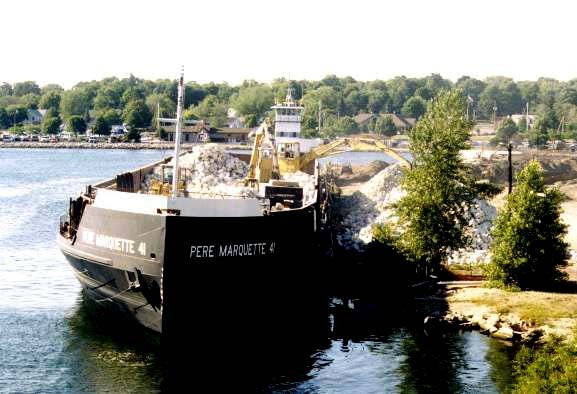 The Pere Marquette 41 departed Ludington on July 21st bound for Manitowoc for a load of stone for the new marina in Ludington. 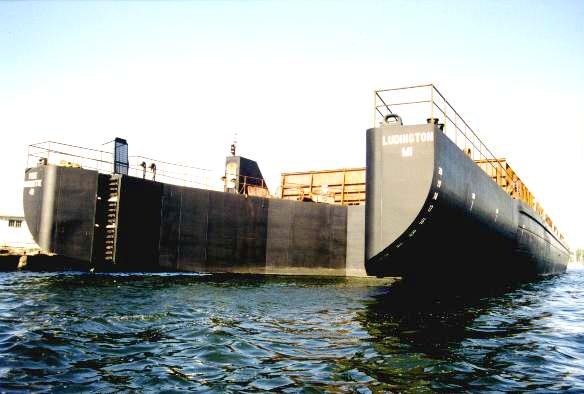 She arrived Ludington with her first load of cargo on July 26st. 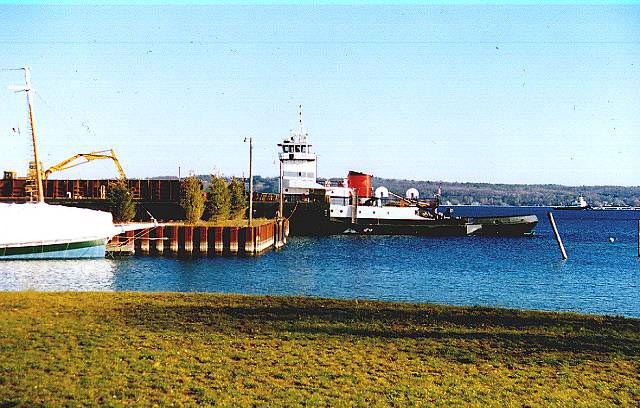 At the old Traverse City Light and Power coal dock on the west side of bay, by J.R.Hengartner. 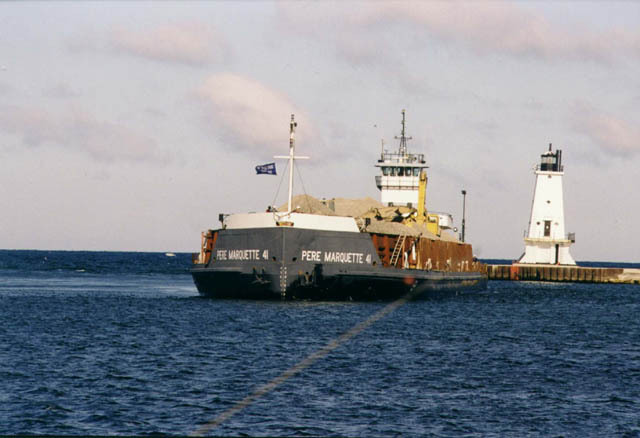 The articulated tug barge PERE MARQUETTE 41, after a 2 hour shakedown cruise on Friday, April 16, departed Ludington at at 9:00 AM on Sunday, April 18 for her first trip of the 1999 shipping season. 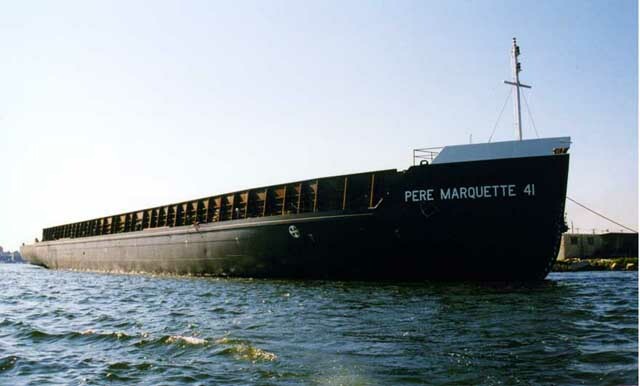 The tug barge, which is owned by Pere Marquette Shipping Company of Ludington, headed for Marinette, Wisconsin to pick up a load of cargo bound for Chicago, ILL.
Captain Richard Oldow is in command of the vessel. 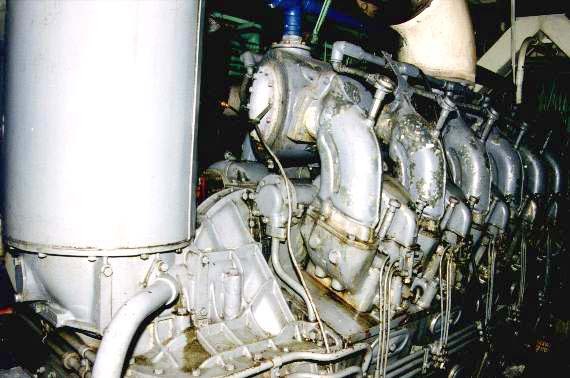 A graduate of the U.S. 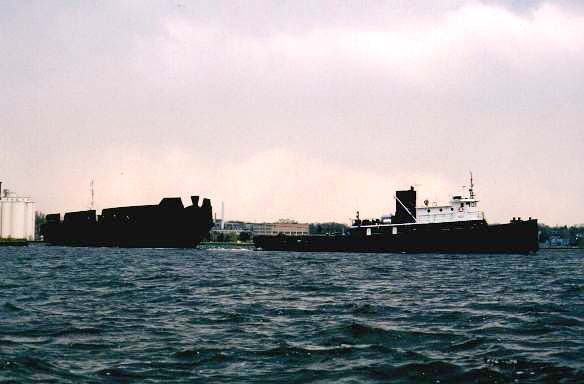 Merchant Marine Academy in Kings Point, New York, he joined Pere Marquette Shipping in March. 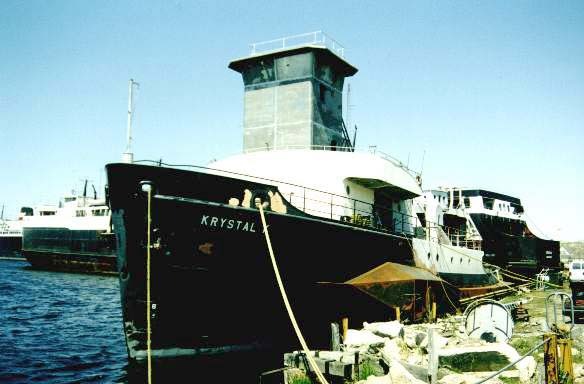 He has over 20 years of experience sailing tugs in Alaska, the Pacific Northwest, Gulf of Mexico, and the Great Lakes. 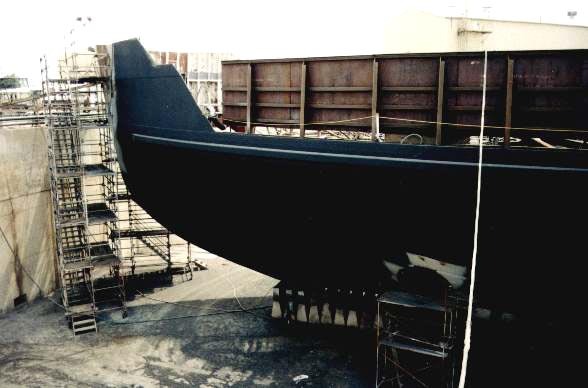 During the winter lay up, upgrades were made to the water ballast system and safety equipment on the PERE MARQUETIE 41. 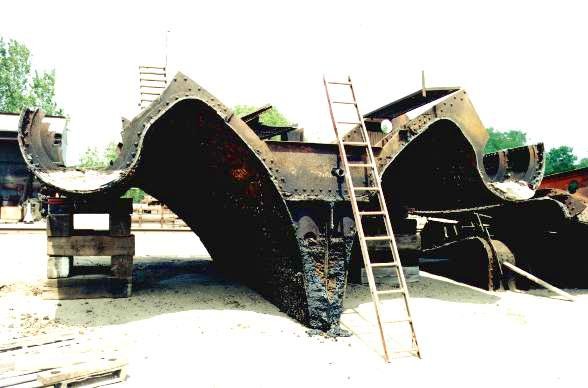 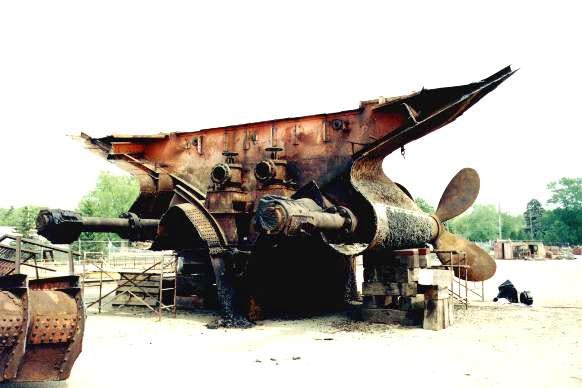 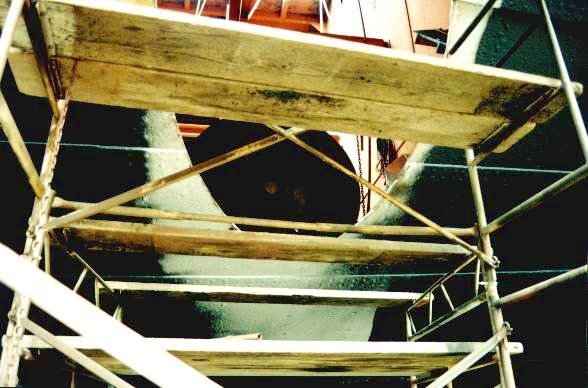 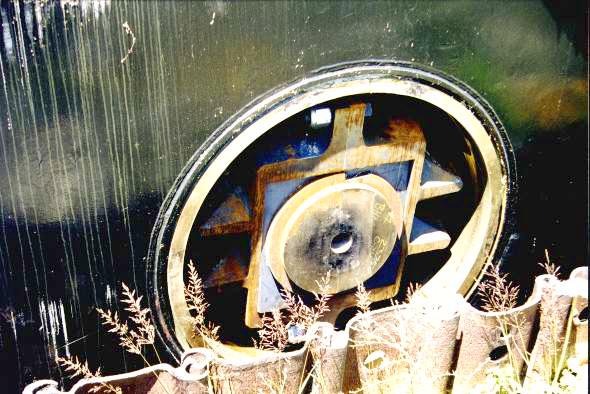 Steel replacement in the tank top plating was also completed, and a major over-haul was performed on the tug UNDAUNTED's starboard main engine. 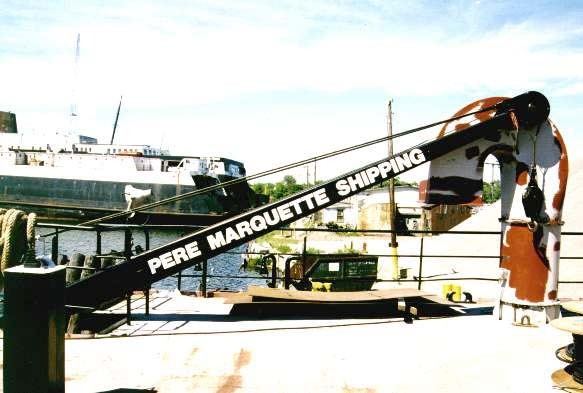 The PERE MARQUETTE 41 is the former car ferry CITY OF MlDLAND 41, and was converted to an articulated tug barge in 1998. 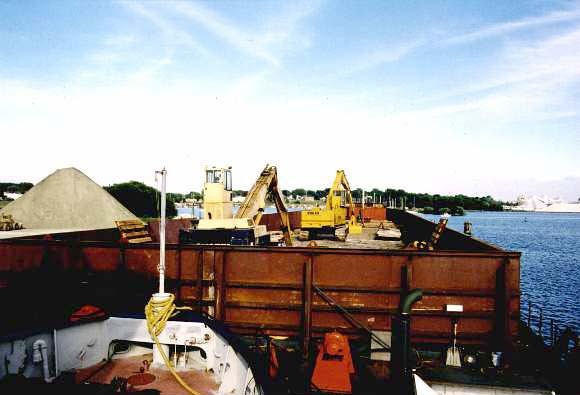 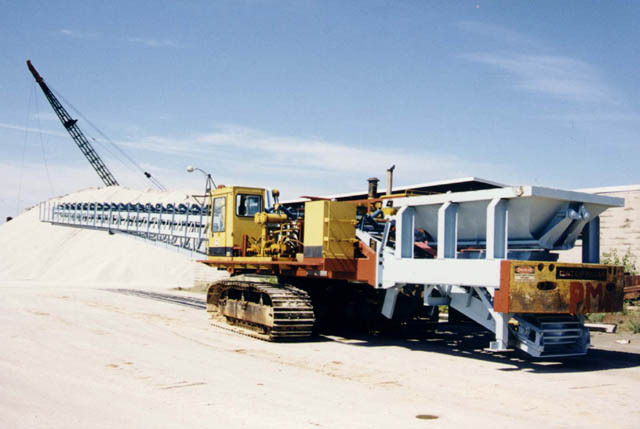 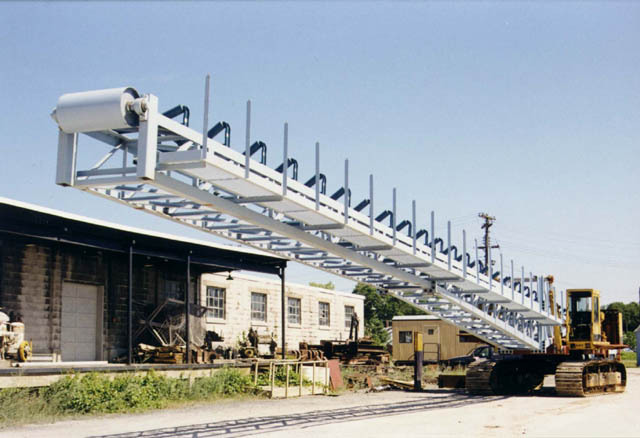 A new Conveyor Cat unloading system will be installed this summer, allowing placement of material in a conical pile up to 80' from the side of the ship. 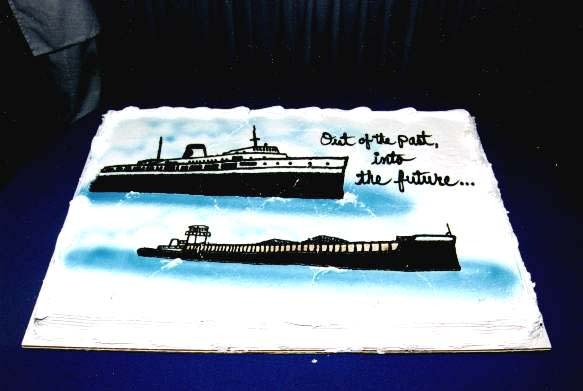 Illustrasion courtesy of Ed Wiltse, Pere Marquette Shipping Company.